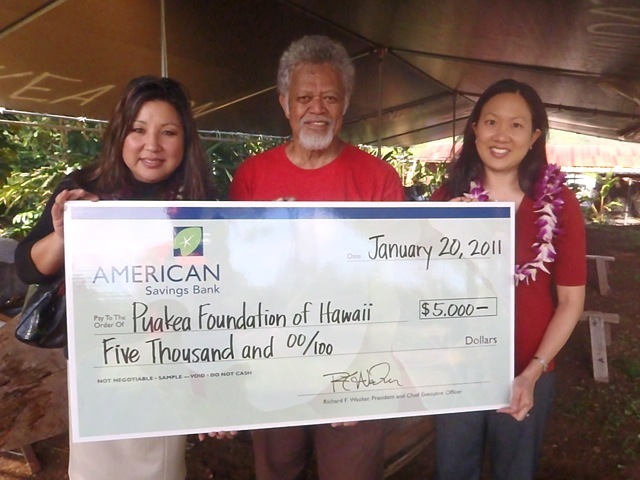 Mahalo Nui to American Savings Bank! American Savings Bank presenting Uncle Bobby with $5000 to help replace his stolen tools. The first day the word went out about the theft of thousands of dollars’ worth of tools from Uncle Bobby, one of the first calls to come in was from American Savings Bank. They donated $5,000 to the Foundation! Featured here with Uncle Bobby are Laurie Komatsu and Patti Cristobal. We are so incredibly grateful for their support – to give so generously without asking! That is warm aloha and it will bless all of the canoes and paddles that carry the spirt of Polynesian canoe canoe around the world.